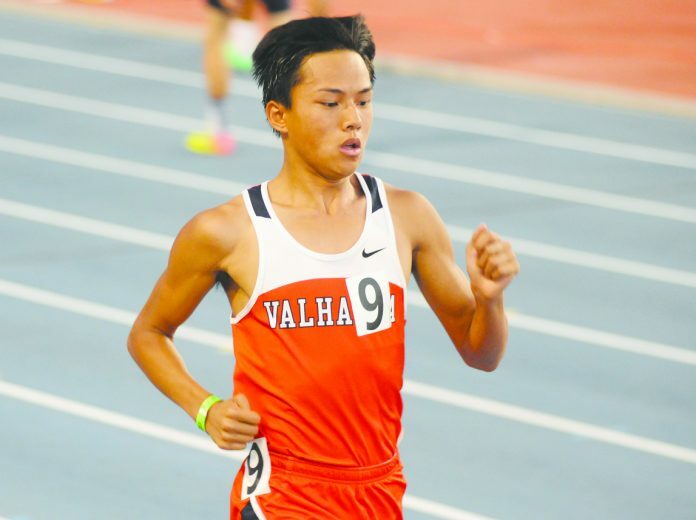 Valhalla High School senior Alex Lieu was a surprise entrant in last weekend’s 100th running of the California state high school track and field championship meet at Buchanan High School in Clovis. He was certainly in for the surprise of his life after recording a ninth-place finish in the boys 300-meter intermediate hurdles to cap his high school career. Initially, Lieu — this year’s Grossmont Hills League champion in both the boys 110-meter high hurdles and 300 intermediate hurdles — did not qualify for last weekend’s state meet. Only the top three place-finishers in each event at the San Diego Section championship meet May 26 at Mt. Carmel High School earned the right to advance to the prestigious two-day event. Lieu had finished fourth in the 300 intermediate hurdles. 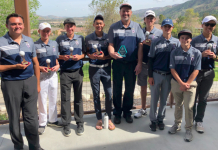 However, when Southwest El Centro High School senior Tyler Saikhon (the second-place finisher) elected not to compete at the state meet, a spot opened for Lieu. He did not waste the opportunity. 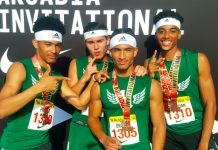 Including Lieu’s late entry, the Grossmont Conference advanced athletes to compete in 12 events at last weekend’s elite gathering of high school track and field athletes from around the Golden State. 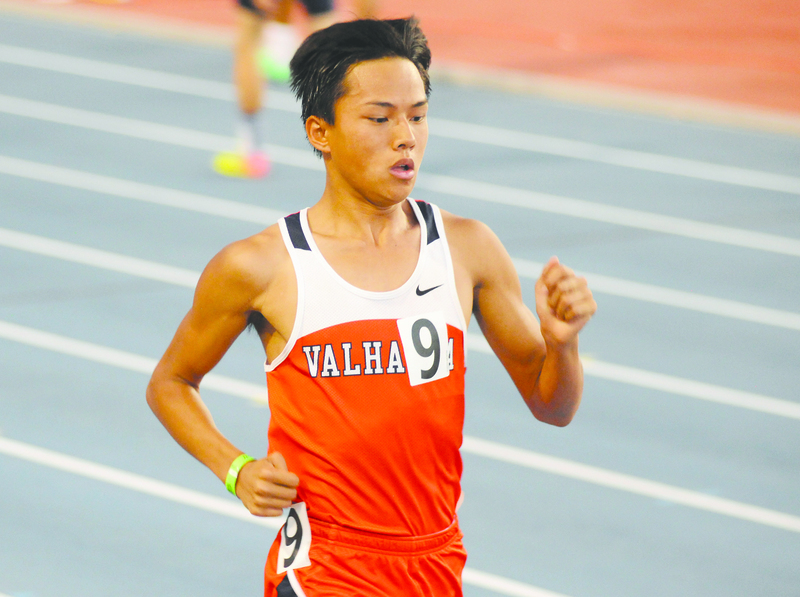 Lieu was one of eight East County athletes who competed in 10 individual events. In fact, he was one of two East County entrants in the 300 intermediate hurdles, joining Granite Hills senior Dylan Coleman. Lieu had beaten Coleman at the league finals but Coleman had placed higher than Lieu at the ensuing section finals — third in both hurdles events — to punch his ticket to the state meet. Lieu got the better of the ongoing rivalry with Coleman at last Friday’s state prelims by advancing to Saturday’s state finals. The top finisher in each of three prelim heats, plus athletes with the next six top times, advanced to the championship finals the following day. Lieu finished with the eighth-fastest qualifying time of 38.85 seconds, a school record, to secure a berth among the nine competitors in the championship finals. Coleman finished farther down the list with the 18th-fastest prelim time of 40.49 and did not advance to the championship heat. At the section finals, Coleman had timed and a personal record 14.63 in the high hurdles and 39.02 in the intermediate hurdles whereas Lieu had timed 15.23 in the high hurdles and 39.55 in the intermediate hurdles. The following day, in the state finals, temperatures soared near the 100-degree mark at the suburban Fresno venue. Many athletes had difficultly matching their prelim marks. Lieu was unable to match his school record time on Saturday, placing ninth with a time of 38.96 — 0.11 seconds slower than the previous day but 0.26 seconds faster than the 39.22 time he posted in winning the event at the league finals on May 9. The Valhalla hurdler missed out on some shiny hardware: the top six place-finishers at the state finals receive medals. Upland junior Caleb Lutalo Roberson won the state title in 36.61. Visalia Redwood sophomore Brandon Andrade (seventh, 38.27) and Cosumnes Oaks senior Pierre Scott (eighth, 38.77) both finished ahead of Lieu in the championship heat. Farmer had won the San Diego Section title in 37.81. Lieu ended his high school career with school records in both hurdles events — 15.01 in the high hurdles (set at the league finals) and 38.85 in the intermediate hurdles (set at the state prelims). Lieu will attend San Diego State University in pursuit of academics. Since SDSU does not have a men’s track and field team, his appearance at last weekend’s high school state finals turned out to be his last athletic competition. “It was a great way to end my career,” he said. Granite Hills’ Coleman and West Hills freshman Brandy Atuatasi each qualified to compete in two events at last Friday’s state prelims. Atuatasi, the section’s Division II champion in both the girls shot put and discus throw, finished 19th in a field of 25 qualifiers in the discus throw with a mark of 133-9 and 22nd in a field of 30 qualifiers in the shot put with a mark of 38-5.75. She had finished second at the section finals with a 135-0 mark in the discus throw and a 39-3 mark in the shot put. Coleman had clocked a personal record 14.63 at the section finals in the 110 high hurdles and 39.02 in the 300 intermediate hurdles. He could not duplicate those marks at last Friday’s state prelims, timing 14.83 in the high hurdles and 40.49 in the 300 hurdles. Coleman finished 18th out of 25 entrants in the intermediate hurdles and 22nd in the field 25 entrants in the high hurdles. Coleman was among three Granite Hills High School qualifiers for this year’s state meet, joining fellow seniors David Leber (discus throw) and David Gonzalez (shot put). All were first-time state meet qualifiers. All admitted they were honored to compete alongside the state’s best high school track and field athletes. None of the three Eagles advanced beyond the first day of competition. The top 12 prelim finishers advanced to the state finals in the both the shot put and discus throw. Leber recorded the 17th best mark in the field of 28 qualifiers at 157-3 while Gonzalez finished 24th among 30 qualifiers at the state prelims with a mark of 49-8.25. Gonzalez’s athletic career appears to just be taking off, however. A fullback, running back and tight end on the Granite Hills football team that advanced as far as last fall’s San Diego Section Division II semifinals, Gonzalez will be playing college football this fall at the University of Utah. 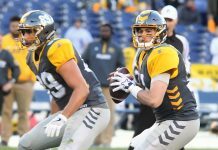 During his senior season with the Eagles, the 6-foot-3, 232-pound Gonzalez accumulated 1,020 yards in all-purpose offense and scored 11 touchdowns; he also recorded 94 tackles, 6.5 sacks and one fumble recovery on defense. Other East County individual state qualifiers included Helix sophomore Eric Parker in the boys 400-meter dash and Mount Miguel senior Kiara Harrison and Steele Canyon senior Mya Cross in the girls long jump. Harrison finished 16th out of 29 prelim qualifiers with a mark of 17-10 while Cross finished 17th with a mark of 17-7.25. Coronado junior Alysah Hickey won this year’s state title at 19-9.75. Parker finished 18th out of 27 qualifiers with a time of 49.91 after setting a PR with a 49.11 time the previous week at the section finals. Marin Catholic senior Max Glasser won this year’s state title in 46.97. Steele Canyon finished 16th out of 26 entrants in the state prelims in the boys 4×100-meter relay (42.51) while Helix finished 18th out of 29 entrants in the state prelims in the 4×400-meter relay (3:22.66). Hickey was the San Diego Section’s lone gold medalist at this year’s state meet and one of 15 section state medalists overall. She also finished fourth in the girls high jump at 5-8 to become a rare double state medalist. For complete results of this year’s state track and field meet, visit the website at www.cifstate.org. superb opportunity to check tips from this site. personally and my office friends to visit your website at the least 3 times every week to study the latest secrets you have. Not to mention, we’re always impressed with your stunning tips and hints you serve. Thanks so much for providing individuals with an extraordinarily superb opportunity to check tips from this site. to study the latest secrets you have. Not to mention, we’re always impressed with your stunning tips and hints you serve.